Transcendence attempts the uncommon Hollywood walk into unprecedented territory with it's ambition and creativity. The result is a well made piece of cinema, but one that doesn't have a particularly neat screenplay. The principle that Transcendence is based on is indeed interesting, yet it tries to be too intelligent and ends up getting lost within itself. The result being a film which is enjoyable to watch, but not particularly memorable. 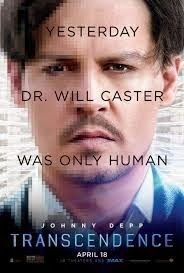 Will Caster (Johnny Depp) and his wife, Evelyn (Rebecca Hall) are well known researchers in the field of Artificial Intelligence, a field which many believe is unethical and are opposed to. After an encounter with a radical, Will's life becomes a time bomb and Evelyn and the Caster's friend and work colleague, Max Waters (Paul Bettany) work towards fulfilling Will's legacy with Will as the subject this time. However, nobody ever realised how far Will's memory would go. 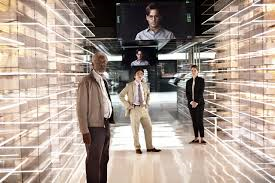 There are two major underlying themes of Transcendence and the screenplay is moulded around these two themes. One theme is executed beautifully and the other has trouble trying to execute itself in a coherent and believable fashion. Firstly there is the theme of the ethical question of A.I. The film wants to make us ponder how far can you take A.I. before it becomes unethical. In the film we see this ideas taken to a place which demonstrates the dangers of relying on A.I., as well as on technology (a more common theme in film). However, the point which it takes us to to show us this is so extreme and it becomes a little too farfetched to be taken seriously. Not only farfetched, the basis for the story is nearly impossible and there are quite a few holes in the film which are apparent to anyone whether they are technologically minded or not. The film gives the impression of wanting to seem so spectacular and mind blowing that it ends up confusing itself as well as it's audience. It leaves the audience feeling as though they are confused, but not because of the intellectual side as much as because the execution hasn't been as believable as it should be. The theme of grief in the film is the one that is more successful in it's execution, but clouded over by the technological side of the film. As Transcendence is first and foremost a sci-fi film, it is understandable why this theme is not the main focus, but it is still lost in the confusion more than what it should be. In the film, Evelyn is a grieving wife who's inability to let go of her husband is one of the reasons everything gets so out of hand. Her grief distorts her perception of reality, which is not uncommon for people in her situation. She hangs on to the memory of her husband and believes everything she must in order to believe that Will is still around. While grieving in the real world such a situation as this wouldn't happen, but Evelyn's behaviour is perfectly executed in the film for someone grieving the loss of their soul mate. Despite the screenplay bringing the film down, the production side of the film is a lot more successful. Visually the film is wonderful to look at and the production design exquisite. With each location you feel as though you really are there, such as in the Caster's garden or in the laboratory. The quirky little town Evelyn travels too is incredibly interesting to see on screen. 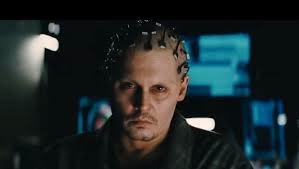 Johnny Depp may be the top billed actor in Transcendence, but he really doesn't have too much to do in the film. There is nothing wrong with his performance, it is more that he doesn't actually physically appear in the film a great deal and his role is particularly limited in what he can do with it. A great deal more of the film belongs to Rebecca Hall. She does very well as the grieving wife and gives a particularly moving performance. Even when Will's presence is in her life after his death, she still gives the impression of a broken and fragile woman while she wasn't this before his death. The chemistry between Depp and Hall is not as strong in the first part of the film as it is in the latter part. Paul Bettany is very good in his role as Max Waters. Bettany has the wonderful ability in this film of being able to portray exactly how he is feeling without saying a word, which is evident even in the first scene when he is in the garden. His performance is a particularly emotional and endearing one. His Max is the voice of reason in Evelyn's dark hours, but even then you can tell that it is not an easy thing for him to do. Transcendence is a highly interesting film to talk about for it's confusing execution of an interesting subject. It tries hard, but doesn't seem to realise how to execute itself efficiently.